You’ve heard lots of information on traffic in Johns Creek. Many of the conclusions I feel are based on erroneous assumptions and intuitions. 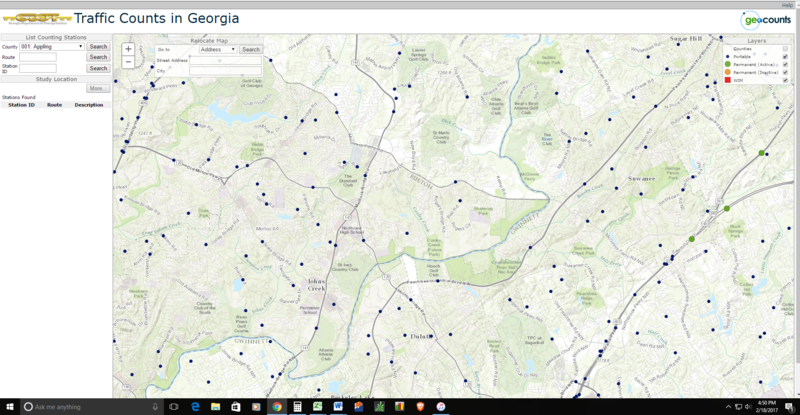 The GDOT (Georgia Department of Transportation) surveys data at locations throughout our state and you have access to that data for yourself to confirm or deny your very own assumptions about the traffic you personally experience. Above is a local map of the Johns Creek area. Each dot is a location that GDOT surveys traffic volumes. By clicking on the individual dot, you will then be presented with a new window which includes three tabs which allows you to more closely look at the historical data for that location. It is important to note that these surveys only measure through traffic at the locations specified. The data is not collected at intersections but between intersections. So, as my example will show, the data from 141 is collected for the directions North and South. The new window will show you information about the location you have selected. In this case it is Wilson Road. 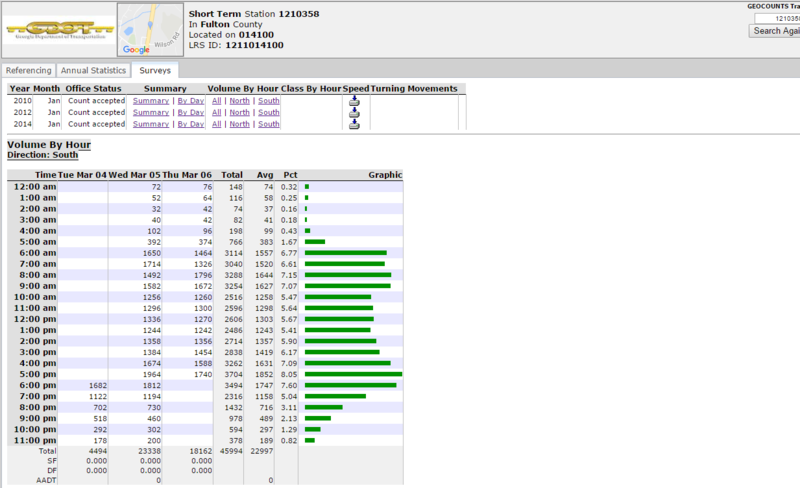 There are two additional tabs that you will want to explore: Annual Statistics and Surveys. The Annual Statistics shows traffic volumes as they were measured. Be sure to not that on years where a survey was not done, GDOT estimates volume. Ignore the estimates and only look at years with actual surveys. For this station we have data going back to 1990. Highlights for this station include 42550 vehicles in the year 2010, more than our most recent survey in 2014. Looking back over the last decade, the volume at 141 just north of Wilson Road has been rather static and not rising as we are told it has been. Keep in mind that the population of Johns Creek has risen sharply over the last decade, suggesting to me that we are having less through traffic and more local traffic than we had ten years ago. The Surveys Tab is where you can drill down into the actual surveys. Here is where we can “drill” down into the directions of the traffic by day, by hour, and by direction. It has been my experience that the surveys, while extending over three dates, will contain one full 24 hour period for the same date. 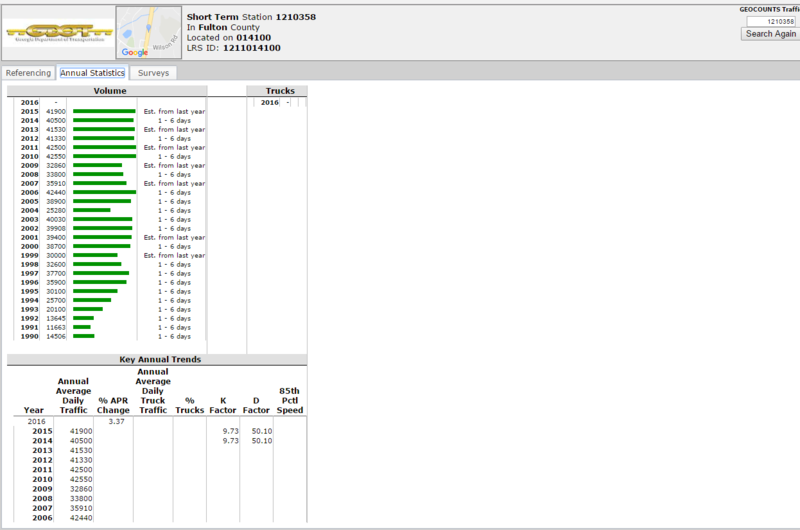 Here we can see the totals for both North and South Bound traffic for the station. Above is the volume by hour for North Bound traffic. Above is the volume by hour for South Bound traffic. If you choose you can also download all the data by clicking on the hard drive icon you see under the speed column. I encourage you to use this site, analyze the data, and draw your own conclusions about what you see and learn. If you have any questions or observations, please leave me a comment. Have you notice a difference between the Survey tab and The Annual Statistics? For example, Wilson Rd 3/2104 Survey Tab shows a ADT of 44,972, but the reported on the Annual Tab is 40,500. Just trying to get to the real numbers. One shows an increase in traffic and the other a decrease. Also, any idea why N1, N2 and S1, and S2 are always identical in the Survey tab??. I believe N1 and N2 are the same because they are not differentiating the lane traffic when collected. If they were to collect specific data by lane you would see two sets of long hoses cover both lanes and a short set of two hosed covering one lane only. I will look at the difference between the survey data and annual and let you know what I can find. Any thoughts on the difference since our last exchange? I have looked at that survey and others and I cannot say for certain. The numbers do not appear to match exactly the other surveys for Wilson Road either. So, if I were to guess, I would think it could be an adjustment for vehicles with more than one axle. For instance, a tractor trailer could have 5 axles and count as 2.5 vehicles.